Psst, wanna do a phrontisterion?? Last March I received an email asking if I wanted to do a phrontisterion. I stopped for a bit and checked to see if the door to my office was closed. I assumed this was sorta like one of those 'Do you want an inflatable doll' message which seems to come through once a day and often with some wild photos attached. I have this nightmare of getting caught with an inflatable doll on my screen and since I didn't have any idea what a 'phrontisterion' was I assumed it must be greek for inflatable doll. I was wrong. Phrontisterion actually refers to 'a thinking-place' and is associated with Socrates' school in the 423 B.C. play "The Clouds" by Aristophanes. OK, no doll and I can open my office door but why would anyone be doing a phrontisterion in 1999? Turned out the original message came from a fellow name Chris Crawford who lives in southern Oregon just north of Ashland in some of the most drop dead gorgeous country south of Mt. Denali in Alaska. I meet Chris a couple of years ago at Dana Atchley's second dstory.com get together in Crested Butte Colorado. Years before that, I had read Chris' book 'The Art of Computer Game Design' which first started me thinking about computer games as art. At dstory Chris presented a very early version of his Erasmatron technology for interactive storytelling. He rambled on about the continuing 2 cultures problem ala C.P. Snow's scientific/cultural divide which from his point of view would wreak havoc in our fast evolving multimedia world. The obvious result of the two cultures problem would result in one group with the cultural understanding of what should be said but not the ability to say anything and another group with the technical skills to write multimedia but nothing worth saying. dStory at the time was mostly 'digital' storytellers with an interest in non-linear digital tools such as Premier and After Effects which produce linear stories similar to video and film so most folks sort responded with "Uhh, I don't see the problem? I can do what I want to do just fine." Chris' Erasmatron technology was an attempt to create a storytelling engine for non-technical folks to create interactive stories without worrying about misplaced C pointers and memory leaks. It was also designed to attempt to coral the exploding nodes problem of writing interactive fiction. You know, the choose-your-own-adventure approach to writing interactive fiction? Node 1: boy kisses girl. Left node 2: girl slaps boy. Right node 3: girl kisses boy back. All succeeding nodes go down both left and right so in terms of written nodes you have exponential growth: 1, 2, 4, 8, 16 and so forth ... The exploding nodes problem means that the writer or more likely the writers have to write like crazy anticipating all possible directions. It is pretty obvious that this can't work so Chris' Erasmatron technology attempts to use probablities to aniticiapte possibilities and still maintain dramatic tension and a compelling storyline. It isn't completely there yet but it is a helluva start. So, if anyone can attempt a phrontisterion in 1999 it probably is Chris since he actually has a track record for phrontisterion-like events. According to legend he invited a bunch of folks to a bar-b-q in his backyard about 10 years ago when he lived in San Jose. At the time the 'thinking school' was thinking about computer games and how to advance the industry. Out of this backyard thinking emerged what is today one of the largest and most lucrative game development events yearly, the Computer Game Developer's Conference (www.gdconf.com). 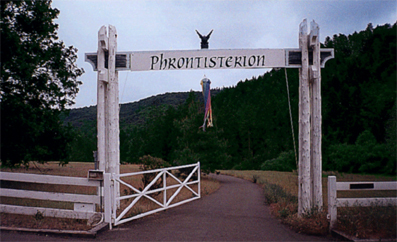 So, when Chris asks if you want to come to southern Oregon and do a phrontisterion the smart thing to do is to say yes first, figure out what a 'phrontisterion' is second and figure out what we are going to think about third which is what I did. Usually when I go to conferences these days I do a workshop in interactive storytelling, game design or immersive history but this wasn't going to be one of those types of events. This was not going to be a normal conference because it was going to be a phrontisterion, it was going to be half way between San Francisco and Portland which meant it was going to be either real expensive to get to from the midwest or a long drive from the SF airport. Not having a lot of money but having a lot of time -- remember I'm a prof in real life -- I opted for the long drive. We are talking northern California, southern Oregon, Mount Shasta, beauty the likes I never see in the midwest. A long drive in beautiful country is actually a short drive. Well, it did become a little longer once I got north of Redding, California and Mount Shasta loomed and I realized I forgot a camera. I immediatley pulled into the nearest Target and purchased a cheap camera to take pictures of the phrontisterion allegedly for tax purposes but in reality to take about 75 pictures of Mount Shasta from every angle imaginable which added at least 3 hours to my drive because I'd go 500 yards, pull over and click, click, click. Eventually night fell and my cheap camera was useless in the dark trying to capture the essence of a 15,000 foot high mountain so I crossed the border into Oregon and eventually found my way past Ashland and through the Jacksonville Historical district before I became hopelssly lost. There was some sort of tourist thing happening in Jacksonville so I found a cop and asked him if there was tent camping anywhere near by. He pointed me down the road with instructions to go about 7-8 miles and look for a yellow sign on my right and to turn left for about 3/4 miles before another sign on my right which should point the way to Cantrall-Buckley park which is on Applegate River and had no RVs -- it was heaven. I have never gone to a conference where I camped out but I highly recommend this form of conferencing. It beats the Hilton by a mile. Should we piggyback on the games industry or start afresh? What lessons, positive and negative, can we learn from related technologies/industries? What do we want from an ideal technology, artistically and technically? What's our business model? Should we sell over the web or in stores? Artistically, are we literature, cinema, games, or...? Can we bootstrap our industry or will we need big launch funding? Where will we find the talent to staff our industry? What existing talent pools can we draw on? How can we overcome "Two Cultures" frictions? What have we learned here and where do we go from here? Most of the early discussion had to do with the possible relationship the interactive fiction industry has/should have/should not have with the computer game industry. Remember, most of the folks in that circle either are or were game developers. The question is obvious but there was no consensus. Some folks felt as if it was obvious that computer games are interactive fictions so the discussion was moot. Others felt as if the two areas were completely different but the audience was the same. Still others felt as if interactive fictions are very different from games and should have no connection to the game industry because the association would create expectations which interactive fiction can not and should not meet. Since interactive fiction is a literary reference there was discussion of how this new media can be best distributed. The net is obvious but what about book stores which are open late into the evenings with patrons interested in fiction and stories? Again, no consensus. The hot area of discussion began with a discussion of technologies such as Chris' Erazzmaton, the Oz project, Improv and VRML but it quickly becam obvious that there was some disent from the 'real' writers in the circle. Laura Mixon, the sci-fi writer, who worked with Chris' technology pointed out that writing 'Shatter Town' an interactive fiction took almost 17 months due to technical problems, her lack of understanding of the tool, The fact that the software was still evolving didn't help. For the writer, it is much easier to just write a book than it is to write anything interactive. She wrote 'Shatter Town' for the experience but there is a major problem for writers when their words are entombed in software which may not exist in a year or two. 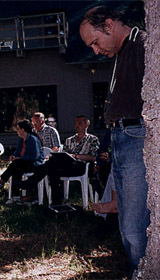 Other writers in the group also voiced a desire for tools which will allow their words and work to flow through technology rather than being entombed. HTML is an obvious choice but it is very inadequate for truly interactive writing. The problem is that the pencil for interactivity does not exist yet. Big problem for writers! The idea of online worlds such as Ultima, EverQuest and Furry Muds were discussed. These are worlds where hundreds of thousands of folks go to 'role play' story, to make believe they are in King Aurtur's Court, that they are Lancelot and Guinivere. These are worlds where they, the interactors, create totally new and original characters. But, traditional dramatic tension creates its own tension if it is your character who must die in order to maintain the tension. The two cultures discussion was a true eye-openner because as soon as the issue was raised the most technical folks in the group just up and left the circle. No discussion. There were about 15 folks left in the circle. Most folks left in the circle felt that most children today do not suffer this divide. They are as comfortable with programming and 3D modeling as they are with storytelling. For most in the group the university was blamed as a major contributor to the two cultures by their time honored arts, humanities and science colleges and departments which compartmentalizes students into almost self selecting groups. Another big issue was economic: writers are paid crap compared to programmers. No way around that one. Eventually we reached the end of the second day. Many questions were raised and few were answered. But that was ok. Interactive storytelling is new and like all media before it it will take some time to come into its own. McLuhan pointed out that the content of every new medium is an old medium: film munched on theater; photography on painting; television on film and so it goes. Interactive fiction which seems to be munching both the computer game and storytelling at the same time. Eventually the form of the new media reveals itself and it will be unlike anything we ever imagined. Remember the the original purpose of the phone was to deliver music into the home. Chris was right there is a divide but not necessarily C.P. Snow's divide. There are chasms between the game and the story, between the market and the artist, between the writer and the programmer, between space and narration, between interactivity and drama, between the desires of men and women. Chasm after chasm, conflict after conflict. In Aristophanes' "The Clouds" the Phrontisterion did not have a happy ending. Socrates and his pupils were ridiculed, and at the end of it, their school, the Phrontisterion, was burned to the ground. Chris' Phrontisterion looks to have a much happier ending. Each person at this years Phrontisterion is allowed to invite two others for next year which will probably bring attendance to 50+. Next year there will be even less agreement. Camps will form. Media will be designed. Markets will be created. Money will be made and a new industry will emerge. So why is interactive storytelling important? Interactive storytelling is definitely first cousin to the computer game but it is also first cousin to film and TV and more importantly to the book and reading in general. It is just human storytelling being filtered through yet one more medium designed by human beings to communicate with other human beings. It is an unmistakable fact that reading is not popular among young people. According to the 1998 National Assessment of Educational Progress only 40% of high school seniors read at or above their grade level. 27% percent of all high school seniors never read on their own or for pleasure (37% just for guys). Every day 3 million books are checked out of libraries at the same time 6 million videos are rented. Like it or not we seem to be becoming an aliterate culture. I say seem because it is also an unmistakable fact that the internet is probably the greatest literary machine ever invented and that includes books. It is impossible to actually use the internet without reading. So, considering that the younger generation averages nine hours a week surfing the Web, nearly 38 percent longer than the average adult Internet user ("The Net-Powered Generation," Forrester Research) then you have to see that the future of reading is online which is inherently interactive which leads me back Chris Crawford's phrontisterion on interactive storytelling. If you want kids to read then you give them the content they want to read in the form they want which is going to be a highly interactive format. We make the medium and the medium remakes us. In the 60's music and television remade the boomer generation into a generation their parents didn't recognize. Today there is another remake going on and it is our new interactive media which is remaking the kids. Kids are being remade to expect to interact, to lean in and make a difference. They do not want to read or watch passively. I haven't had to tell my son to turn off the TV in years but I have had to get him off line. Given the chance he will sit there all night reading and writing ... just like the old days! I can not imagine a single area of human thought or activity which can not be embodied in a print-based book or magazine and I also can not imagine a single area of human thought or activity which can not be embodied in an interactive storytelling medium. I can imagine many areas which can be better embodied in interactive storytelling than in paper-based print such as science, math, art and music. So, is is Chris Crawford's phrontisterion on interactive storytelling important? You make the call. for my part I'll just say: Duh! As an aside, shortly after Oregon I went to the Canadian film center to teach game design to a roomful of high school guys. On day two we were discussing ideas, trying to figure out what game ideas would work and what wouldn't, trying to figure out what was worth spending 3 weeks developing. Just into the discussion on day two an idea popped up which no one could deal with. A 13 year old boy raised his hand and said, "I don't know, it just doesn't work for me, the story isn't there, I need a good storyline." The story was the bushman's most sacred possession. These people knew what we do not; that without a story you have not got a nation, or culture or civilization. Without a story of your own to live, you haven't got a life of your own. -Laurens Van Der Post, Lost World of the Kalahari. Sincerely, Thom , your maitre d'Igital for the CafeTechnos. For the past five years, Chris has been funded by the Markel Foundation to develop the Erasmatron, a tool for professional storytellers. The Erasmatron was named after Chris' hero, Desiderius Erasmus, the sixteenth century writer. The Erasmatron allows writers to create a totally new "interactive fiction" tailored to both the strengths of the computer and the strenghts of the writer, the story builder. The result is very different from linear scripts which have fixed beginnings, middles and ends. If you click onto Chris' site you will find the Erasmatron tools free for the downloading. The tools are still rough and changing but there is nothing like this anywhere else on the net. These tools deserves to be taken out for a test drive. You will also find Laura Mixon's 'Shatter Town' interactive story along with years of Chris' writing on the idea of interactivity. This is the best site on the web for deep thinking about what interactivity is and can be. We create new hypertext technologies and publish serious hypertext, fiction and non-fiction: serious, interactive writing. Eastgate is one of the original commercial hypertext publishers. As they say, they are for serious hypertext. They have a collection of work ranging from mystery to poetry, all hypertext. Their StorySpace tool is the best commercial tool on the market for writing hypertext and thionking about the potential of interactive fiction. Alice is more aimed at interactive 3D graphics than storytelling but Alice has serious leanings as a storytelling tool. Alice is a 3D interactive graphics programming environment for Windows 95/98/NT built by the Stage 3 Research Group at Carnegie Mellon University. The current version of Alice authoring tool is free for the download and runs on most wintel computers. Worlds created in Alice can be viewed and interacted with inside of a standard web browser once the Alice plug-in has been installed. NICE is a project that applies virtual reality to the creation of a family of educational environments for young users. Nice is based on constructionism, where real and synthetic users, motivated by an underlying narrative, build persisting virtual worlds through collaboration. This approach is grounded on well established paradigms in contemporary learning and integrates ideas from such diverse fields as virtual reality, human-computer interaction, CSCW, storytelling, and artificial intelligence. The goal is to build an experiential learning environment that will engage children in authentic activity. Our prototype system explores the above ideas within the CAVE(TM) virtual reality theater. Granted few people have access to CAVE(TM) technology which is immersive in that either you have an almost wrap-around desk or you have a walk in room painted with rear projection screens, but this technology will eventually creep into our living rooms. The IMPROV Project at NYU's Media Research Lab is building technologies to produce distributed responsive virtual environments in which human-directed avatars and computer-controlled agents interact with each other in real-time. IMPROV is also exploring speech and gesture recognition. Imagine a world where we come to school as avatars. Oz is a computer system developed at Carnegie Mellon that allows authors to create and present interactive dramas. Oz includes a simulated physical world, several characters, an interactor, a theory of presentation, and a drama manager. A model of each character's body and of the interactor's body are in the physical world. Outside the physical world, a model of mind controls each character's actions. The interactor's actions are controlled by the interactor. Substitute the word 'audience' for interactor and flash back to Julian Beck's Theater of the Living Arts in the 60s where the actors were as likely to be sitting next to you as standing up on stage.